Desktopsub is a small impulse compensated suboofer. Two Omnes Audio woofers SW 6.01 are used. Desktopsub has been developed by Bernd Timmermanns. 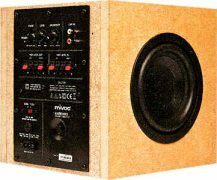 The impulse compensation (woofers are arranged in pairs opposite each other) reduces resonances of the cabinet for a better controlled bass.